For the figure skater, see Sasha Cohen. In this name, the family name is Baron Cohen, not Cohen. Sacha Noam Baron Cohen (born 13 October 1971) is an English actor, comedian, screenwriter, and producer. A graduate of Christ's College, Cambridge, Baron Cohen is most widely known for creating and portraying four fictional characters: Ali G, Borat Sagdiyev, Brüno Gehard and Admiral General Aladeen. Like his idol Peter Sellers, he uses a variety of accents and guises for his characters. In most of his routines, Baron Cohen's characters interact with unsuspecting people who do not realise they are being set up for comic situations and self-revealing ridicule. His other work includes voicing King Julien XIII in the Madagascar film series (2005–2012) and appearing in Sweeney Todd: The Demon Barber of Fleet Street (2007), Hugo (2011) and Les Misérables (2012). He made a cameo as a BBC News Anchor in Anchorman 2: The Legend Continues (2013). In 2016, he played an English football hooligan brother of an MI6 spy in the comedy film Grimsby, and co-starred as Time in the fantasy sequel Alice Through the Looking Glass. Baron Cohen was named Best Newcomer at the 1999 British Comedy Awards for The 11 O'Clock Show, and since then, his work has been further recognised with two BAFTA Awards for Da Ali G Show, several Emmy nominations, a nomination for an Academy Award for Writing Adapted Screenplay, and a Golden Globe for Best Actor for his work in the feature film Borat. 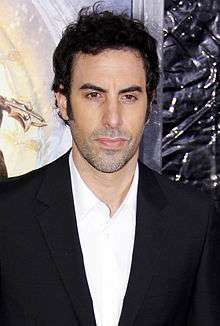 After the release of Borat, Baron Cohen stated that because the public had become too familiar with the characters, he would retire Borat and Ali G. Similarly, after the release of Brüno, Baron Cohen stated he would also retire the title character. At the 2012 British Comedy Awards, he received the Outstanding Achievement Award, accepting the award while reprising his Ali G character. In 2013, he received the BAFTA Charlie Chaplin Britannia Award for Excellence in Comedy. Baron Cohen was born in Hammersmith, west London. His mother, Daniella Naomi (née Weiser), who worked as a movement instructor, was born in Israel. His father, Gerald Baron Cohen (1932–2016), a clothing store owner, was born in London and raised in Wales. Baron Cohen was raised Jewish. He is fluent in both Hebrew and English. Baron Cohen's father's family were Eastern European Jews who moved to Pontypridd, Wales and London, England, and his mother's family were German Jews. His paternal grandfather, Morris Cohen, had added "Baron" to his surname. His maternal grandmother, who lived in Haifa, Israel, trained as a ballet dancer in Germany. Baron Cohen has two older brothers: Erran and Amnon. Erran is a composer and has worked on several of Sacha's films. Baron Cohen's cousin, Simon, is an internationally renowned autism researcher. Baron Cohen was educated at The Haberdashers' Aske's Boys' School, an independent school in Elstree, Hertfordshire, north of London. Baron Cohen went on to the University of Cambridge, entering Christ's College, Cambridge, where he read history, graduating in 1993 with upper-second-class honours. While attending the Cambridge University Amateur Dramatic Club, Baron Cohen acted in the plays Fiddler on the Roof and Cyrano de Bergerac, and performed in Habonim Dror Jewish theatre performances. "He [Peter Sellers] was this incredibly realistic actor, who was also hilarious and who managed to bridge the gap between comedy and satire." —Baron Cohen on his greatest influence, fellow British comedian Peter Sellers. After leaving university, Baron Cohen worked for a time as a fashion model, appearing in many fashion magazines. By the early 1990s, he was hosting a weekly programme on Windsor cable television's local broadcasts with Carol Kirkwood, who later became a BBC weather forecaster. In 1995, Channel 4 was planning a replacement for its series The Word, and disseminated an open call for new television presenters. Baron Cohen sent in a tape of himself in the character of Kristo, an Albanian fictional television reporter (who developed into the Kazakh Borat Sagdiyev), which caught the attention of a producer. Baron Cohen hosted Pump TV from 1995 to 1996. Peter Sellers, known for portraying a wide range of comic characters using different accents and guises, was referred to by Baron Cohen as "the most seminal force in shaping [his] early ideas on comedy". In 1996, he began presenting the youth chat programme F2F for Granada Talk TV and also had a small role in an advert for McCain Microchips playing the role of a chef in a commercial entitled "Ping Pong". He took clown training in Paris, at the Ecole Philippe Gaulier, studying under master-clown Philippe Gaulier. Of his former pupil, Gaulier says: "He was a good clown, full of spirit". In the late 1990s, Baron Cohen made his first feature film appearance in the British comedy The Jolly Boys' Last Stand. In 2000, Baron Cohen played the part of Super Greg for a series of TV advertisements for Lee Jeans; the advertisements never aired but the website for Super Greg created an internet sensation. Baron Cohen appeared during two-minute sketches as his fashion reporter Brüno on the Paramount Comedy Channel during 1998. He shot to fame when his comic character Ali G, an uneducated, boorish junglist, hailing from Staines (a suburban town in Surrey, to the west of London), started appearing on the British television show The 11 O'Clock Show on Channel 4, which first aired on 8 September 1998. A year after the première of the show, GQ named him comedian of the year. He won Best Newcomer at the 1999 British Comedy Awards, and at the British Academy Television Awards he was nominated for Best British Entertainment Performance. Da Ali G Show began in 2000, and won the BAFTA for Best Comedy in the following year. Also in 2000, Baron Cohen as Ali G appeared as the limousine driver in Madonna's 2000 video "Music", directed by Jonas Åkerlund, who was also responsible for directing the titles for Da Ali G Show. Baron Cohen is a supporter of the UK charity telethon Comic Relief which is broadcast on the BBC, and as Ali G interviewed David Beckham and wife Victoria in 2001. In 2002, Ali G was the central character in the feature film Ali G Indahouse, in which he is elected to the British Parliament and foils a plot to bulldoze a community centre in his home town, Staines. His television show was exported to the United States in 2003, with new episodes set there, for HBO. At the 2012 British Comedy Awards, 13 years after winning Best Newcomer at the 1999 Comedy Awards, Baron Cohen accepted the Outstanding Achievement Award from Sir Ben Kingsley in the guise of Ali G, and stated: "I is grown up now. I ain't living in my nan's house anymore. I is living in her garage". Ali G's interviews with celebrities (often politicians) gained notoriety partly because the subjects were not privy to the joke that Ali G, rather than being a real interviewer, was a comic character played by Baron Cohen. According to Rolling Stone magazine, Baron Cohen would always enter the interview area in character as Ali G, carrying equipment and appearing to be an unsuspecting crew member. He would arrive with a suited man, whom the interviewee naturally thought was the interviewer. Baron Cohen, as Ali G, would sit down to begin conducting the interview by asking the interviewee some preliminary questions. The interviewee, however, would remain under the impression that the smartly-dressed director would be conducting the interview until short notice prior to cameras rolling: this would grant an advantage of surprise, whereby the interviewee would be less likely to opt out of the Ali interview prior to its start. Borat: Cultural Learnings of America for Make Benefit Glorious Nation of Kazakhstan, a feature film with Borat at the centre, was screened at the 2006 Toronto International Film Festival and released in the United Kingdom on 2 November 2006, in the United States on 3 November 2006 and Australia 23 November 2006. The film is about a journey across the US in an ice cream truck, in which the main character is obsessed with the idea of marrying Pamela Anderson. The film is a mockumentary which includes interviews with various Americans that poke fun at American culture, as well as sexism, racism, homophobia, anti-Semitism, and jingoism. It debuted at the #1 spot in the US, taking in an estimated $26.4 million in just 837 theatres averaging $31,600 per theatre. 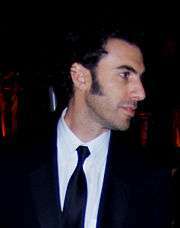 Baron Cohen won the 2007 Golden Globe in the "Best Actor – Musical or Comedy" category, his sixth such award. Although Borat was up for "Best Motion Picture — Musical or Comedy", the film lost to Dreamgirls. On 23 January 2007, he was nominated for an Academy Award for Best Adapted Screenplay. He shared his nomination with the film's co-writers, Ant Hines, Peter Baynham, Sy Mordecai Finesto, Dan Mazer, and Todd Phillips. Aside from the comic elements of his characters, Baron Cohen's performances are interpreted by some as reflecting uncomfortable truths about his audience. He juxtaposes his own Jewish heritage with the anti-Semitism of his character Borat. In 2007, Baron Cohen published a travel guide as Borat, with dual titles: Borat: Touristic Guidings To Minor Nation of U.S. and A. and Borat: Touristic Guidings To Glorious Nation of Kazakhstan. On 21 December 2007, Baron Cohen announced he was retiring the character of Borat. Another alter ego Sacha Baron Cohen performed as is 'Brüno', a flamboyantly gay, Austrian fashion show presenter who often lures his unwitting subjects into making provocative statements and engaging in embarrassing behaviour, as well as leading them to contradict themselves, often in the same interview. Brüno asks the subjects to answer "yes or no" questions with either "Vassup" (what's up) or "Ich don't think so" (No); these are occasionally substituted with "Ach, ja!" (Ah yes!) or "Nicht, nicht" ("Nicht" means "not" in German). In one segment on Da Ali G Show, he encouraged his guest to answer questions with either "Keep them in the ghetto" or "Train to Auschwitz". Brüno's main comedic satire pertains to the vacuity and inanity of the fashion and clubbing world. In May 2009, at the MTV Movie Awards, Baron Cohen appeared as Brüno wearing a white angel costume, a white jockstrap, white go-go boots, and white wings; and did an aerial stunt where he dropped from a height (using wires) onto Eminem. Baron Cohen landed with his face on Eminem's crotch, with his crotch in Eminem's face, prompting Eminem to exit the venue with fellow rappers D12. Eminem later admitted to staging the stunt with Baron Cohen. After an intense bidding war that included such Hollywood powerhouses as DreamWorks, Sony, and 20th Century Fox, Universal Pictures won and paid a reported $42.5 million for the film rights. A number of shill companies and websites were created in order to draw potential interviewees into interviews by creating an illusion of legitimacy. The film was released in July 2009. Baron Cohen's 2012 film, The Dictator, was described by its press as "the heroic story of a dictator who risked his life to ensure that democracy would never come to the country he so lovingly oppressed". Baron Cohen played Admiral General Aladeen, a dictator from a fictional country called the Republic of Wadiya. Borat and Brüno film director Larry Charles directed the film. The main target of the film's satire was Libyan dictator Muammar Gaddafi, who was still alive when the film was written. The producers of the film were concerned it would anger Gaddafi, possibly even resulting in a terrorist attack, so they released deliberate misinformation saying that the film was loosely based on a romance novel written by former Iraqi dictator Saddam Hussein. On 26 February 2013, Baron Cohen was allegedly banned from attending the 84th Academy Awards in his role as Admiral General Aladeen but the rumour was denied by the Academy, saying "we haven't banned him, he is lying" but made it clear that "Cohen is not welcome to use the red carpet as a platform for a promotional stunt". Cohen eventually appeared at the awards' red carpet with a pair of uniformed female bodyguards, holding an urn which he claimed was filled with the ashes of Kim Jong-il. The "ashes", which Baron Cohen admitted to Howard Stern on the Tuesday, 8 May 2012 episode of The Howard Stern Show were flour, were "accidentally" spilled onto Ryan Seacrest. 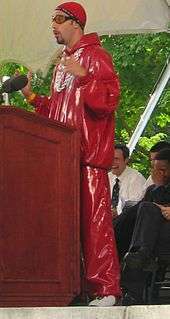 In an interview with Neil Hamilton in 2000, Ali G offered Hamilton what was allegedly cannabis, which Hamilton accepted and smoked, creating some minor controversy in the British media. At the 2006 MTV Movie Awards, Borat introduced Gnarls Barkley's performance of "Crazy", where he made a comment about Jessica Simpson, saying that he liked her mouth and that he could see it clearly through her denim pants. At the 2006 UK premiere of Borat, he arrived in Leicester Square in a cart pulled by a mule and a number of "Kazakh women," announcing: "Good evening, gentleman and prostitutes. After this I stay in a hotel in Kings Cross. We will all drink, wrestle with no clothes on and shoot dogs from the window." Baron Cohen has been criticized for the racist or prejudiced comments his characters have made (see Da Ali G Show). HBO spokesman Quentin Schaffer has replied to criticism concerning Baron Cohen's characters, "Through his alter-egos, he delivers an obvious satire that exposes people's ignorance and prejudice in much the same way All in the Family did years ago." Regarding his portrayal as the anti-Semitic Borat, Baron Cohen says the segments are a "dramatic demonstration of how racism feeds on dumb conformity, as much as rabid bigotry", rather than a display of racism by Baron Cohen himself. "Borat essentially works as a tool. By himself being anti-Semitic, he lets people lower their guard and expose their own prejudice", Baron Cohen explains. Addressing the same topic in an NPR interview with Robert Siegel, Baron Cohen says "...and I think that's quite an interesting thing with Borat, which is people really let down their guard with him because they're in a room with somebody who seems to have these outrageous opinions. They sometimes feel much more relaxed about letting their own outrageous, politically incorrect, prejudiced opinions come out." Baron Cohen, the grandson of a Holocaust survivor, says he also wishes in particular to expose the role of indifference in that genocide. "When I was in university, there was this major historian of the Third Reich, Ian Kershaw, who said, 'The path to Auschwitz was paved with indifference.' I know it's not very funny being a comedian talking about the Holocaust, but it's an interesting idea that not everyone in Germany had to be a raving anti-Semite. They just had to be apathetic." Regarding the enthusiastic response to his song, "In My Country There Is Problem" (also known as "Throw the Jew Down the Well"), he says, "Did it reveal that they were anti-Semitic? Perhaps. But maybe it just revealed that they were indifferent to anti-Semitism." Baron Cohen walked onto the runway during the Ágatha Ruiz de la Prada fashion show in Milan on 26 September 2008. In the character of one of his alter-egos Brüno, he was wearing a costume made out of velcro. He appeared on the stage with a blanket and items of clothing stuck to his velcro suit. Lights were turned off while security intervened and escorted him off the stage, and the fashion show resumed normally shortly thereafter. Baron Cohen and his team allegedly accessed the fashion show using fake IDs. During an appearance on Late Show with David Letterman, Baron Cohen stated he was restricted from answering David Letterman's question as to how he managed to get an interview with Pat Buchanan while in character as Ali G due to pending "legal reasons". The government of Kazakhstan threatened Baron Cohen with legal action following the 2005 MTV Europe Music Awards ceremony in Lisbon, and the authority in charge of the country's country-code top-level domain name removed the website that he had created for his character Borat (previously: http://www.borat.kz) for alleged violation of the law—specifically, registering for the domain under a false name. The New York Times, among others, has reported that Baron Cohen (in character as Borat) replied: "I'd like to state that I have no connection with Mr. Cohen and fully support my government decision to sue this Jew". He was, however, defended by Dariga Nazarbayeva, a politician and the daughter of Kazakhstan President Nursultan Nazarbayev, who stated, "We should not be afraid of humour and we shouldn't try to control everything..." The deputy foreign minister of Kazakhstan later invited Baron Cohen to visit the country, stating that he could learn that "women drive cars, wine is made of grapes, and Jews are free to go to synagogues". After the worldwide success of the Borat film, the Kazakh government, including the president, altered their stance on Baron Cohen's parody, tacitly recognising the invaluable press coverage the controversy created for their country. Baron Cohen encountered another problem around his Borat character. Two of the three University of South Carolina students who appear in Borat sued the filmmakers, alleging that they were duped into signing release forms while drunk, and that false promises were made that the footage was for a documentary that would never be screened in the US. On 11 December 2006, a Los Angeles judge denied the pair a restraining order to remove them from the film. The lawsuit was dismissed in February 2007. On 22 May 2009, a charity worker at a seniors' bingo game sued Baron Cohen, claiming an incident shot for Brüno at a charity bingo tournament left her disabled. However, the worker later retracted her statement, saying the "actor never struck her", but that he "beat her down emotionally to the point she's now confined to a wheelchair". The scene did not make the final cut for the film. The case was dismissed in late November 2009 on Anti-SLAPP grounds with all lawyer's fees to be paid by the charity worker. The dismissal was appealed and upheld on 12 September 2011. A lawsuit was filed on 30 April 2010 in the District of Columbia by Palestinian Christian Ayman Abu Aita of Beit Sahour, Bethlehem, West Bank, against Baron Cohen relating to his interview which was used in Brüno. Aita, a former member of Fatah, alleges that he has been defamed by false accusations that he is a terrorist. Aita included David Letterman in the suit based on comments made during the 7 July 2009 appearance by Baron Cohen on the Late Show with David Letterman. On 4 November 2010, the D.C. case was dismissed with Aita given 120 days to file in the Supreme Court of the State of New York, County of New York or have the case permanently dismissed. The case was re-filed in the Supreme Court of New York in 2011 and dismissed on 18 July 2012. Baron Cohen guest-starred in the fifth season of Curb Your Enthusiasm, with Dustin Hoffman as a guide to Heaven. He also provided the voice of the ring-tailed lemur king, King Julien, in DreamWorks Animation's film series, Madagascar, and appeared as Will Ferrell's arch rival the French Formula One speed demon Jean Girard in the 2006 hit Talladega Nights: The Ballad of Ricky Bobby. He also appeared alongside Johnny Depp in the 2007 film Sweeney Todd: The Demon Barber of Fleet Street as Signor Adolfo Pirelli, co-starred in Martin Scorsese's 2011 adventure film Hugo, and portrayed Thénardier in the 2012 film version of the musical Les Misérables. He appeared as a BBC News Anchor in Anchorman 2: The Legend Continues (2013). Baron Cohen tends to avoid doing interviews out of character. However, in 2004, he did the talk show circuit appearing as himself on Late Show with David Letterman, The Opie and Anthony Show, The Howard Stern Show, and others in order to promote the forthcoming season of his show on HBO. He was also interviewed on NPR's All Things Considered. He also did an interview with Rolling Stone, published in November 2006, that the magazine labelled as "his only interview as himself". He also appeared in an interview out of character with Terry Gross on NPR's Fresh Air on 4 January 2007. Baron Cohen has twice presented the MTV Europe Music Awards, first as Ali G on 8 November 2001, in Frankfurt, Germany, and then as Borat on 3 November 2005 in Lisbon, Portugal. Baron Cohen appeared out of character to accept an award at the British Comedy Awards in December 2006. He said at the time that Borat could not make it to the awards as "he's guest of honour at the Holocaust denial conference in Tehran", referring to the International Conference to Review the Global Vision of the Holocaust. Borat director Larry Charles explains that Baron Cohen generally appears in character partly to "protect his weakness", by focusing public interest on his characters rather than himself. His other reason, Newsweek claims, is that Baron Cohen is fiercely private: "...according to the UK press, his publicists denied not only that he attended a party for the London premiere of Borat, but also that a party even occurred." In September 2010, representatives for Cohen confirmed that he would be playing Freddie Mercury in a biopic about the rock singer. He dropped out of the project in July 2013, citing "creative differences" between him and the surviving members of Queen. Queen guitarist Brian May later said that even though the band and Baron Cohen were on good terms, they felt that Cohen's presence would be "distracting". Baron Cohen shot a spread with supermodel Alessandra Ambrosio for Marie Claire magazine to promote the film Brüno. Sports Illustrated's 6 November 2006 issue contains a column called "Skater vs. Instigator", which illustrates various amusing "parallels" between Baron Cohen and figure skater Sasha Cohen, ranging from their mutually held personal significance of the number 4, to their mutual romantic interests in redheads. Baron Cohen was featured in the Time 100 list for 2007. In 2010, Baron Cohen guest-starred on The Simpsons in the episode "The Greatest Story Ever D'ohed" as Jakob, a quick-tempered Israeli tour guide. Baron Cohen's Grimsby (The Brothers Grimsby in the US) was released in 2016. He plays the football hooligan brother of a British MI6 spy. The film received mixed reviews from critics and was a failure at the box office. On November 3, 2016, it was announced that Baron Cohen will headline the American remake of the Danish comedy Klown. Baron Cohen first met actress Isla Fisher in 2002 at a party in Sydney, Australia. The couple became engaged in 2004. Subsequent to Fisher's conversion to Judaism, the two married on 15 March 2010 in Paris, France in a Jewish ceremony. Baron Cohen and Fisher have two daughters - Olive, born 19 October 2007 in Los Angeles, and Elula Lottie Miriam, born in August 2010 - and a son - Montgomery Moses Brian, born 17 March 2015. Baron Cohen first acted in theatrical productions featuring the Socialist-Zionist youth movement Habonim Dror. He spent a year in Israel volunteering at Kibbutzim Rosh HaNikra and Beit HaEmek as part of the Shnat Habonim Dror, as well as taking part in the programme Machon L'Madrichei Chutz La'Aretz for Jewish youth movement leaders. According to Baron Cohen, "I wouldn't say I am a religious Jew. I am proud of my Jewish identity and there are certain things I do and customs I keep." He tries to keep kosher and attends synagogue about twice a year. On 28 December 2015, Baron Cohen and his wife Isla Fisher donated £335,000 ($500,000) to Save the Children as part of a program to vaccinate children in Northern Syria against measles, and the same amount to the International Rescue Committee also aimed at helping Syrian refugees. 2005 Curb Your Enthusiasm Larry's guide Episode: "The End"
Episode: "The Greatest Story Ever D'ohed"
2013 Eastbound and Down Ronnie Thelman Episode: "Chapter 29"
Madonna: "Music" (2000) as Ali G.
2012 – Won British Comedy Award, Outstanding Achievement Award. 2006 – Won: Los Angeles Film Critics Association Award for Best Actor. 2006 – Won: San Francisco Film Critics Circle Award for Best Actor. 2006 – Won: Toronto Film Critics Association Award for Best Actor. 2006 – Won: Deutscher Comedypreis (German comedy award) for Best International Comedy. 2007 – Nominated: Golden Globe for Best Picture Comedy/Musical. 2007 – Nominated: London Film Critics' Circle Award for British Actor of the Year. 2007 – Nominated: Writers Guild of America Award for Best Adapted Screenplay (shared). 2007 – Nominated: Academy Award for Best Adapted Screenplay (shared). 2007 – Won: MTV Movie Award for Best Comedic Performance and Nominated for Best Movie as well and Best Fight with Ken Davitian. 2007 – Won: Evening Standard British Film Awards: Peter Sellers award for Best Comedy. ↑ "Isla Fisher and Sacha Baron Cohen finally wed". News.com.au. 22 March 2010. Retrieved 31 July 2010. ↑ "Baron Cohen, Sacha". BFI Film & TV Database. Retrieved 6 November 2006. ↑ "Sacha Baron Cohen is the Peter Sellers of our age". The Telegraph. 30 May 2016. ↑ "Borat and Ali G are dead for Sacha Baron Cohen". actressarchives.com. The Daily Telegraph. 21 December 2007. Retrieved 15 July 2012. 1 2 3 "Sacha Baron Cohen honoured at British Comedy Awards". BBC News. 1 2 Tracy, K. (2007). Sacha Baron Cohen: The Unauthorized Biography: From Cambridge to Kazakhstan. St. Martin's Press. p. 10. ISBN 9781429993937. Retrieved 22 November 2014. 1 2 Glazer, Sarah (July–August 2010). "The Provocative Baron Cohen Clan". Moment. Retrieved 31 July 2010. 1 2 Marquis Who's Who (2001). Who's who in Finance and Industry, Volume 32. Marquis Who's Who. p. 38. ↑ Mount, Harry (15 September 2006). 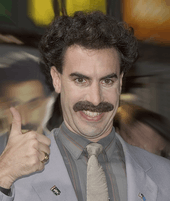 "Kazakhstan launches propaganda campaign against Borat". The Daily Telegraph. London. Retrieved 6 November 2006. ↑ "Valley G's wicked Welsh rootz". BBC News. 28 March 2002. Retrieved 22 November 2006. ↑ White, Roland (21 January 2007). "Borat's easy ... being me is odd". The Times. London. Retrieved 18 June 2007. 1 2 3 4 5 Strauss, Neil. "The Man Behind The Mustache". Rolling Stone. Archived from the original on 2 January 2007. ↑ Rayner, Jay (24 February 2002). "Mutha of invention". The Guardian. London. Retrieved 6 November 2006. ↑ Jay Rayner (4 November 2005). "Mutha of invention". The Observer. London. Retrieved 7 August 2010. ↑ "Nick Cohen meets Simon Baron-Cohen, Cambridge professor of developmental psychopathology". New Statesman. 26 February 2007. Retrieved 1 November 2010. ↑ Andrew Anthony (7 June 2009). "Sacha Baron Cohen: The comic who is always in your face". The Observer. Archived from the original on 7 November 2011. ↑ "Alumni: Distinguished Members: Sacha Baron Cohen". Christ's College, Cambridge. Archived from the original on 7 November 2011. 1 2 Sacha Baron Cohen: Our man from Kazakhstan. The Observer. 10 September 2006. ↑ Saunders, Robert A. (2009). The Many Faces of Sacha Baron Cohen: Politics, Parody, and the Battle Over Borat. p. 22. Lanham, Maryland: Rowman & Littlefield. ↑ McCain's Micro Chips Ping Pong TV Ad Commercial. 20 May 2012 – via YouTube. ↑ Lauerman, Kerry (3 November 2006). "It's Borat Day!". Salon. Video Dog. Retrieved 12 August 2009. ↑ "Ali-G Interviews Posh Spice and David Beckham". Youtube.com. 26 February 2006. Retrieved 17 January 2012. ↑ Strauss, Neil (14 November 2006). "The man behind the mustache". Rolling Stone. Retrieved 14 August 2008. ↑ "'Borat' takes U.S. by storm Finishes No. 1 with $26.4 mil on just 837 screens". Hollywood Reporter. 9 October 2015. ↑ Ant Hines, Borat Sagdiyev and Sacha Baron Cohen (2007). Borat: touristic guidings to glorious nation of Kazakhstan : touristic guidings to minor nation of U. S. and A. Boxtree. ISBN 0-7522-2661-4. Retrieved 4 March 2012. ↑ "Comedian Cohen says he is killing off Borat". Google. AFP. 21 December 2007. Retrieved 31 July 2010. ↑ "Eminem-Bruno Stunt on MTV Was Planned". MSNBC. 6 February 2009. Retrieved 18 September 2010. ↑ "Borat is Rich...NOT". Forbes. 13 November 2006. Retrieved 21 November 2006. ↑ "Sacha Baron Cohen's Guerilla Tactics". 19 March 2009. Retrieved 20 March 2009. ↑ "Sacha Baron Cohen to make film of 'Saddam Hussein book'". BBC News. 20 January 2011. ↑ "First Official Shot From The Dictator". Empireonline.com. Retrieved 17 January 2012. ↑ "The Dictator Trailer & Official Movie Site". Paramount Pictures. Retrieved 6 January 2012. ↑ "A 'Borat' reunion on Sacha Baron Cohen's 'Dictator'?". Los Angeles Times. 15 November 2010. 1 2 "Sacha Baron Cohen: The Fresh Air Interview". NPR. 21 May 2012. Retrieved 24 May 2012. ↑ Belloni, Matthew (22 February 2012). "Academy: Sacha Baron Cohen Not 'Banned' From Oscars But 'Dictator' Stunt Unwelcome". The Hollywood Reporter. ↑ "Hamilton 'shared joint' with Ali G". BBC News. 18 January 2000. Retrieved 10 April 2010. ↑ "MTV Movie Awards: Will Ferrell Freaks Out; Jessica Simpson Dusts Off Daisy Dukes". MTV News. ↑ Ryan McKee. "Sacha Baron Cohen: 5 Things You Didn't Know". AskMen. ↑ Leibovitz, Liel (26 August 2004). "Did Ali G Go Too Far?". The Jewish Week. New York. Archived from the original on 26 August 2004. Retrieved 10 February 2012. ↑ "'Borat' satire turns to farce at Toronto festival". Movies.yahoo.com. Retrieved 31 July 2010. 1 2 Siegel, Robert (23 July 2004). "Ali G: Fooling Serious Interviewees, All for a Laugh". NPR. Retrieved 31 July 2010. ↑ "Sacha Baron Cohen Kicked Out of Milan Fashion Week" Archived 29 September 2008 at the Wayback Machine. ↑ "British comic responds to legal threat against 'Borat'", CBC, 25 November 2005. ↑ "Daughter of Kazakhstan's president defends Borat", CBC, 21 April 2006. ↑ "Kazakh invite for Borat creator", BBC News, 19 October 2006. ↑ Saunders, Robert A. (Spring 2008), "Buying into Brand Borat: Kazakhstan’s Cautious Embrace of Its Unwanted 'Son'", Slavic Review, 67 (1): 63–80. ↑ "Borat Frat Boys Lawsuit Dismissed By Judge Who Secretly Knows Sacha Baron Cohen's Golden Globes Speech By Heart". Defamer.com. 16 February 2007. Retrieved 31 July 2010. ↑ "Richelle Olson : Bruno the Austrian Fashionista Sued". Newsbizarre.com. 7 July 2009. Retrieved 17 January 2012. ↑ "Sacha Baron Cohen - BINGO! Re-Sued". TMZ.com. 13 January 2012. Retrieved 17 January 2012. ↑ "Olson v. Cohen Cal: Court of Appeal, 2nd Appellate Dist., 7th Div., 2011". Scholar.google.com. Retrieved 17 January 2012. ↑ Lundergaard, Erik. "An award for Sacha Baron Cohen? Darn right". Today. Retrieved 22 February 2016. ↑ "Sacha Baron Cohen and His 'Sweeney Todd' Crotch Bulge". Vulture. Retrieved 22 February 2016. ↑ Dargis, Manohla. "Inventing a World, Just Like Clockwork". The New York Times. Retrieved 22 February 2016. ↑ Jones, Kenneth (16 March 2012). "Sacha Baron Cohen, Daniel Evans, Linzi Hateley and More Confirmed for 'Les Miz' Film". Playbill. Retrieved 22 February 2016. ↑ Zuckerman, Esther (Dec 18, 2013). "A Definitive Ranking of All the 'Anchorman 2' Cameos". Atlantic Monthly Group. Retrieved February 22, 2016. ↑ Meet the Real Sacha Baron Cohen. Fresh Air. 4 January 2007 (advance to 21:10 in the interview). ↑ "Merchant takes top comedy honour". BBC News. 14 December 2006. Retrieved 1 February 2010. 1 2 Gordon, Devin. "Newsweek article". MSNBC. Archived from the original on 28 August 2007. Retrieved 31 July 2010. ↑ May, Brian (17 September 2010). "Sacha Baron Cohen to play Freddie Mercury in film". HARDtalk. BBC News. Retrieved 17 September 2010. ↑ Mawuse Ziegbe (16 September 2010). "Sacha Baron Cohen To Play Freddie Mercury 'Borat' star will portray legendary Queen frontman.". MTV. Retrieved 17 September 2010. ↑ Finke, Nikki (22 July 2013). "Sacha Baron Cohen Exits Freddie Mercury Biopic Over Creative Differences With Queen". Deadline.com. Retrieved 22 July 2013. ↑ BRIAN MAY SPEAKS ON QUEEN BIOPIC PROBLEMS. Ultimate Classic Rock. 19 October 2013. ↑ "Marie Claire Spread". Elitemodels.com. Retrieved 31 July 2010. ↑ Barr, Roseanne (4 May 2007). "Sacha Baron Cohen, Time 100". Time. Retrieved 4 May 2007. ↑ Lang, Brent. "Box Office: 'Zootopia' Rules With $50 Million, Sacha Baron Cohen's 'Brothers Grimsby' Bombs". Variety. Retrieved 2016-03-14. ↑ "Sacha Baron Cohen to Star in Klown Remake". ComingSoon.net. CraveOnline. November 3, 2016. Retrieved November 3, 2016. ↑ "Sacha Baron Cohen and Isla Fisher Wed". People. 22 March 2010. Retrieved 6 May 2010. ↑ "Isla Fisher says marriage with Sacha Baron Cohen is like 'winning the lottery'". hellomagazine.com. 30 October 2012. ↑ "Isla Fisher and Sasha Baron Cohen Wed". Showbiz.sky.com. Retrieved 31 July 2010. ↑ "Isla Fisher and Sacha Baron Cohen's Secret, Six-Guest Wedding". People. Retrieved 25 May 2010. ↑ "It's a baby girl for Borat". Herald Sun. 20 October 2007. Archived from the original on 26 October 2007. ↑ "Find Out The Name of Isla Fisher's Baby". Us Weekly. Retrieved 11 March 2011. ↑ "Sacha Baron Cohen & Isla Fisher Holy Moses It's A Boy!!". TMZ. 16 April 2015. Retrieved 16 April 2015. ↑ Scott, Kirsty (29 September 2006). "He becomes the character, certainly with Ali G and Borat. He has a mix of Sellers's acting and Rod Hull's bottle". The Guardian. Features. UK. Retrieved 16 January 2007. First acted with the Habonim Dror Jewish youth group and at Cambridge in plays such as Cyrano de Bergerac and Fiddler on the Roof. ↑ Steinberg, Jessica (11 May 2012). "Before 'The Dictator' and 'Borat', Friends Recall, Sacha Baron Cohen Was a Very Nerdy, Very Funny, Israel-Oriented Guy". The Times of Israel. Retrieved 30 June 2014. ↑ "Borat's easy ... being me is odd", Times Online article archived by archive.org. ↑ The Greatest Story Ever D'ohed (#21.16). IMDB. ↑ Manning, Kara (May 31, 2000). "Madonna Wraps Video As "Music" Leaks Online". MTV News. Viacom. Retrieved September 6, 2010. ↑ "Top 'TRL' Video Cameos: Ali G Shows Madonna The Real Big Ben!". MTV Buzzworthy. Viacom. November 13, 2008. Retrieved August 29, 2012. ↑ "Ali G 'stars in Madonna video'". BBC News. April 30, 2000. Retrieved March 28, 2015. ↑ "Sacha leaves Borat behind as he steps out with Isla". Hello!. 14 December 2006. Retrieved 9 June 2009. Wikimedia Commons has media related to Sacha Baron Cohen.